The untold stories of the April 14 incident continuous to hit the Human Rights pages of the Daily News. Last week it was the inhuman treatments of Hon Fatou K Jawara and Nogoi Njie that filled the pages with very shocking revelations. 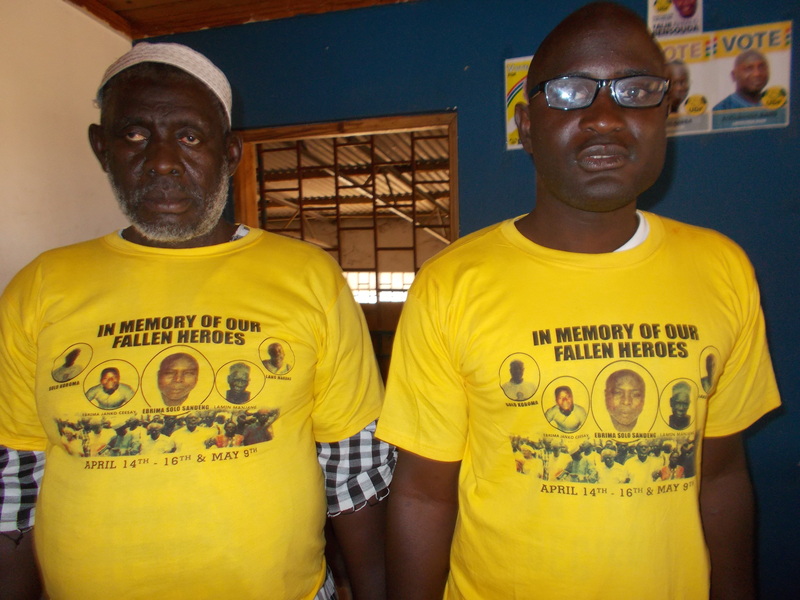 Today Kafu Bayo another April 14 victim tell us his story. Bayo expressed concern and his utter dissatisfaction, saying it is surprising to still see them in their poor health conditions not been properly cared for by the state. “I have 11 children some of who have graduated and others still going to school and it is only me taking care of them with my poor health condition. ; and no single person from my children are working he concluded. Mr. kafu Bayo an ex-police officer who also doubles as UDP ward Chairman at Tujereng village in the kombo South constituency West Coast Region, recalls that on April 14 2015, he and a number of peaceful protesters led by late Solo Sandeng took the streets calling for an electoral reform. He recounted that from the Westfield, they were taking to the (PIU) headquarters in Kanifing where they were all put in a big hall, and started listing their names one after the order. 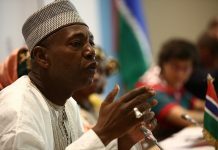 “After listing down the names of 28 people, myself and four others from the listed names of the 28, Kafu Bayo, Ebrima Solo Sandeng, Modou Ngum, Ebrima Jabang and Nogoi Njie. We were ordered by the then IGP of The Gambia Police Force Yankuba Sonko to be handcuff. Kafu said the same IGP ordered for us to be tied together whiles in handcuffs and the (PIU) officers threw us as bundles of none living beings inside the truck”, He said. At the NIA headquarters, we were thrown in dark room, where they asked Solo Sandeng to follow them and soon we heard he loud cries of Solo from their beatings. Saying you are killing me, by then it was me and Ebrima Jabang who were together. When they were done with Solo, Nogoi went and she also started crying the same way like Solo Sandeng. Mr. Bayo explains that it was his turn after Nogoi. “As soon as I enter the dark room, my head was grabbed, forced my hands behind me and cover my head with a black plastic bag” he explained. Tearful Bayo explained how the NIA officers tied his head tiredly while the robe place on his left eye was too tight, as he told one of them that the robe is attached to his eye was too tight, and one of the officers told him this is the tip of the ice bag you are receiving, adding that someone we are going to kill if that person is complaining about his eye he don’t know what he is complaining about. When I responded that I believe that if my time is not up and that you people can’t kill me, I was hit by one Tamba Jatta who happened to break two of my teeth instantly on spot”. “I was tied from my feet up to my neck while lying on the table, and I could notice it was four people beating me up, with an iron cane containing some iron springs in it”. Bayo said the security officers at the NIA were treating them dehumanizing, he explained. Explaining the prison conditions too, Bayo said that was another horrible place. He revealed that prison authorities gave them empty Evian water bottle where they use to urine and in the same bottle will filled with water for them to drink. He said they use butter pots to defecate in while prison. The reason of their protest was mainly to rescue Gambians from the clutches of the former Gambian President, DICTATOR Yahya Jammeh. The Gambia at the time needed someone to rescue them out of such a tyrant. The tortures, jailing, killings, disappearances without trace, force exile were the order of the day”, he said. “We were not armed nor did anyone among us with stone or sticks, except that of our banner with our slogan”, ‘we need proper electrol reform’. “We only have our banners with the slogan bearing ‘we need proper electoral reform’ and we were chanting ‘we need our boarders open, we need price of rice reduce, we want all Gambian’s free. Describing their condition after the tortures, their clothes were all stained with their own blood like people works at a slaughterhouse. “We have spent 14 day at the NIA and the reason why were not seen in court was simply because of our poor conditions. They could not present us in that bad status. Dr. Lamin Sanyang comes to treat them at night so that their conditions could be better in order for them to appear in court. “There was a day the doctor himself Lamin Snyang asked us if you guys are call to appear in court how could you go with this your condition; you are bleeding all over your bodies with all your cloths stained with blood?, we responded this is the only way we can appear in court because we have no other cloths to ware”. He bought us cloths so that we can attend court. Bayo said they were counting on the result of the elections as that would be mayor decider for our faith to live or be killed by the hooligan Yahya Jammeh. He told his cell mate Jabang that he did not heard of anything yet, but he is with the belief that Barrow won, because hadn’t been the case that it was Jammeh who won you we could have heard the none stop jubilation. He said while counting of results were on; particularly on the Busubala constituency one of the security officer at the prison,widely open the volume of the radio for them to hear the result. That was when we announced that Barrrow won the election and Jammeh has accepted defeat. That he even had congratulated Barrow, then the whole prison joined the jubilation, we were knocking and banging on the prison doors he said. He however stressed that people should stop saying all Gambian’s are Jammeh’s victims, yes we might all be Jammeh’s victims but our ways of victimization are being different because for us we have sacrificed our lives.